Our Leather Magnetic Net Releases are beautifully crafted from Latigo Leather, brass & Copper hardware & are extremely helpful. They offer that extra hand while wade fishing. 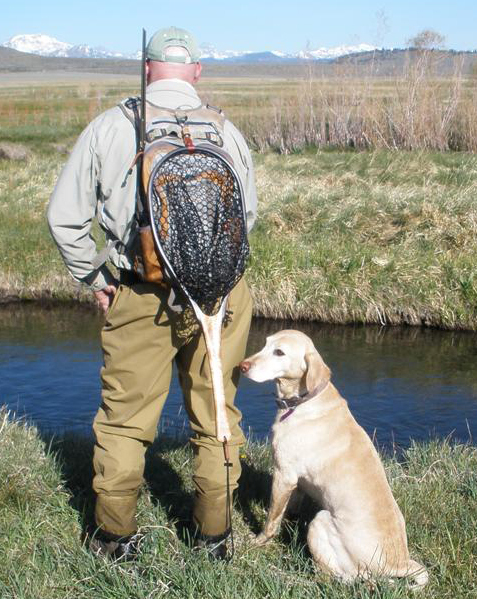 The net hangs, handle down, from your vest/pack/lanyard until you are ready to use it. A quick jerk on the handle to release it, and you are ready to net your fish. To replace the net, the rare earth magnets that Sierra Nets uses are powerful enough to snap back together with ease. These magnets, by design, are stronger than any I have seen in the marketplace. They are meant to keep your net secured safely to your back even when boulder hopping or crashing through stream-side vegetation. This is a fitting magnetic net release to compliment your new custom Sierra Net. It is made of durable yet plush Latigo leather available in either brown or mahogany. The magnet is affixed with a solid copper rivet and a solid brass Chicago bolt which attaches the leather strap to your net. The vest side can be made of any wood species and is attached using a stainless steel carabiner. Custom leather magnetic net releases start at $85.00.